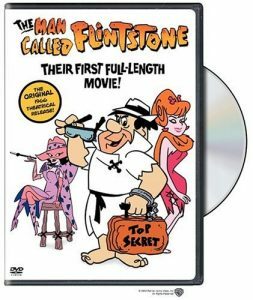 One of my favorite childhood movies was The Man Called Flintstone – released after the end of the original TV series, it uses the well-worn plot line of Fred being an identical duplicate of some “important” person (in this case, secret agent Rock Slagg). Slagg’s boss, Chief Mountmore, decides to use Fred to complete Slagg’s mission. 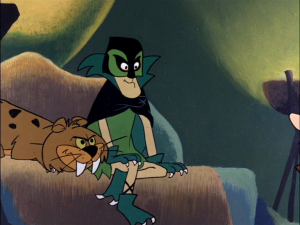 To capture of the evil criminal genius, the Green Goose (voiced with glee by Harvey Korman) before he can take over the world. Fred accepts his patriotic duty and tries to keep his mission a secret from his wife Wilma and their best friends, Betty and Barney Rubble (voiced by Mel Blanc) – but with mixed results. A very funny spoof of the then-popular spy genre. The Man Called Flintstone takes place during the time of the early James Bond films, The Man from U.N.C.L.E., Get Smart, etc. It’s a movie that I would love to watch again — and once again, I can. For many years, there was a bit of legal wrangling, since Columbia Pictures owns the rights to the songs used in the movie while Warner Brothers owns the rights to the movie itself. So, for a long time, it wasn’t even available to view as a rerun on television. Although it thankfully is available again. It’s just as funny now as it was then. Although there are a few musical numbers that could easily be cut and not missed. This movie was produced right after production of the original The Flintstones (1960) series ended. The Man Called Flintstone was intended as a swan song for the characters. Henry Corden, who provided Fred Flintstone’s (uncredited) singing voice, also voiced several incidental characters on The Flintstones (1960). He would later take over Fred’s voice after Alan Reed’s death in 1977. During the Teammates musical number, when Fred and Barney’s airplane falls apart, it becomes the Flintstone Flyer. This is the pedal-powered contraption featured in the very first episode of the series. Unusually, Wilma is seen wearing a blue dress in this film rather than her usual white. The airplane that The Flintstones take to get to Paris has ‘Qantas’ written on the side. Qantas is a real-life airline. One of the odder bits of pop culture cross-pollination from the 1960s, The Man Called Flintstone thrusts Fred Flintstone into the spy game for a feature-length animated musical adventure that’s probably best appreciated by die-hard fans of the modern stone-age family. Released to theaters immediately after the network series left the air in 1966, Flintstone reunites the vocal cast from its final two seasons: Alan Reed as Fred, Mel Blanc as Barney, Jean VanderPyl as Wilma, and Gerry Johnson, who replaced Bea Bernadet as Betty — for this tale of mistaken identities and international intrigue.